The Detroit Red Wings were near the top of the Atlantic Division for the first two months of the season last year, and they looked poised to make a deep run in the Stanley Cup playoffs. However, one by one, the injuries piled up, and Detroit started to slide in the standings. After all games played on December 3, 2013, Detroit was tied for second place with Montreal with 35 points just behind Boston’s 38 points. It was from this point on the Red Wings slowly slipped down the standings until finishing the regular season fourth in the Atlantic Division and eighth in the conference. Adding no pieces in the offseason has many in the Red Wings fan base worried for sure, but losing Mikael Saumelsson, Todd Bertuzzi, Cory Emmerton and Jordin Tootoo is addition by subtraction. The Red Wings have a solid core of forwards and a great goalie, but question marks remain on the back end. Here are four criteria the Red Wings have to fulfill if they want to be a serious Stanley Cup contender. Staying healthy is paramount when it comes to how much the Red Wings will succeed in 2014-15. Last season, the Red Wings were second to the Pittsburgh Penguins in the league with 421 man games lost. Coach Mike Babcock and the players alike will never say the amount of injuries had a direct effect on the season, but it definitely did. Every team goes through injuries, but 10 teams had less than 200 man games lost, and the two Stanley Cup finalists — Los Angeles Kings (100) and New York Rangers (122) — were 29th and 28th in the league respectively in man games lost. Bleacher Report’s Dave Lozo likes the Red Wings chances this year, provided they stay healthy. @jtbourne They had 93 points with their two best players missing half the year and Weiss being a zero. They’ll be fine. @jtbourne I like’em a lot this year. I bet they get their D at the deadline too. Unfortunately for the Red Wings, Pavel Datsyuk and Henrik Zetterberg aren’t getting any younger, and it will take them that much longer to recover each time an injury pops up. Darren Helm started last season on IR, but should be in the starting lineup in October, and Stephen Weiss played 26 games last year while trying to battle a sports hernia injury he kept from the team. Detroit should begin this season much healthier than last year, barring some catastrophic events in training camp and the preseason. Staying healthy is priority No. 1. The young players lifted the Red Wings to a 23rd consecutive playoff berth when Datsyuk and Zetterberg both went down with injuries. Gustav Nyquist spearheaded the production, as he scored two goals in his season debut on Nov. 21 on his way to a 28-goal, 20-assist season in 57 games. Imagine the kind of season Nyquist could have had if he started the season in Detroit instead of Grand Rapids. It might be hard for Nyquist to duplicate that 18.3 shooting percentage he notched last year, but Detroit will still need production from him, as well as Tomas Tatar, Tomas Jurco, Riley Sheahan and possibly tertiary scoring from Joakim Andersson and Luke Glendening. In total, the kids accounted for 150 of the total 579 points the Red Wings had last year, which is about 26 percent of the total scoring. It’s a good percentage to shoot for, especially if Weiss can contribute what he was originally signed to contribute, then the Red Wings will improve on their point total tremendously. Jimmy Howard took a lot of criticism this season a year after signing a six-year, $31.8 million extension in April 2013 that will keep him between the pipes through the 2018-19 season. Howard started the season slow with a 4-4-2 record in October. A lot of it was the defense in front of him hanging him out to dry, but Howard was also not his normal self. Howard finished the season with a 21-19-11 record, 2.66 GAA and .910 save percentage, his worst season since 2010-11. This season is important for Howard. The Red Wings re-signed Jonas Gustavsson (27-16-5, 2.63 GAA, .907 save percentage) to give Howard some competition. Gustavsson far exceeded the expectations of a backup and was another reason the Red Wings were able to make the playoffs for the 23rd consecutive year. 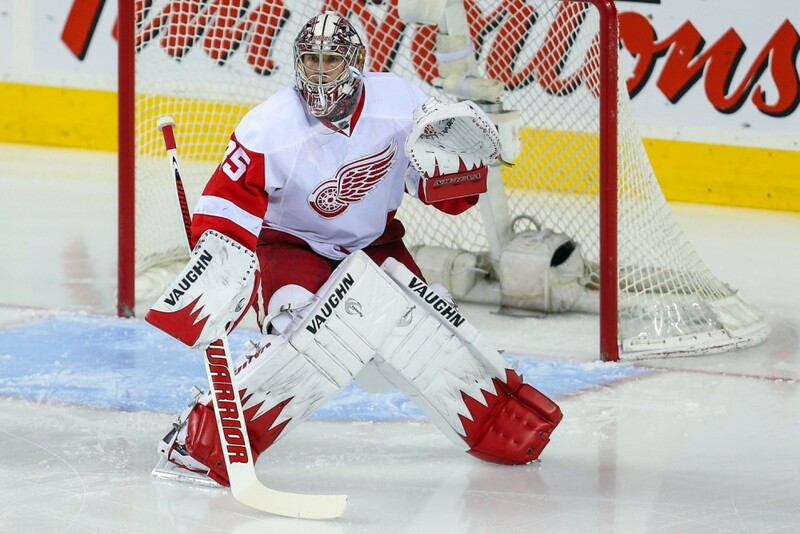 However, with Petr Mrazek most likely spending the majority of the season in Grand Rapids for the final year this upcoming season, Howard will need to make sure he supplants himself as the starter in Detroit. Mrazek won’t be the starter next season should Howard falter this year, but it could be a goalie-by-committee operation should Howard have another off year. The Red Wings need to make a move at the trade deadline — that’s the bottom line. The players on the roster right now, while they are fairly good, do not make up a Stanley Cup-contending team. They need a puck-moving defenseman (preferably right-handed, but I won’t let that be a deal breaker) and a solid scorer to complement Datsyuk, Zetterberg, Nyquist, etc. Detroit swung and missed on a lot of defenseman this offseason, including Christian Ehrhoff, Matt Niskanen, Dan Boyle and Anton Stralman. They could target Penguins defenseman Paul Martin, as he will be a UFA at the end of the 2014-15 season. Toronto Maple Leafs defenseman Cody Franson is another option, as is Brad Stuart, but the odds of Stuart coming back to Detroit after leaving the Red Wings to be closer to his family are slim to none. As far as a scoring option goes, Martin St. Louis and Bobby Ryan are both free agents after this coming season, but would warrant a hefty return from the Red Wings. Damien Brunner will also be a UFA, and the Red Wings would certainly like to have his services back at the low-cost of a $2.5 million cap hit. However, the Red Wings could very well find themselves in the same position they did last year — in possession of a ton of great prospects, but unwilling to deal any of them out for the marquee player. As stated in the tweet above, Lozo believes the Red Wings will get their defenseman this year at the deadline, but I’m not so sure. Holland was unwilling to part with any of his big-time prospects at last year’s deadline, and I don’t see that changing any time soon. I would be willing to trade Jurco and one of the defensive prospects in Grand Rapids (Ryan Sproul, Alexey Marchenko, Xavier Ouellet) for a top-tier defenseman who re-signs with Detroit after this year. Any team trading with the Red Wings is automatically going to go after Nyquist, Tatar or Jurco. General manager Ken Holland has already stated Anthony Mantha is an untouchable, as he rightly should be. The Red Wings will have to be sure the player they are trading for isn’t a rental and is willing to re-sign with Detroit when he becomes a UFA and is worth the cost of giving up one of these prospects.